Today Apple released iOS 4.2.1 for all their mobile devices including iPhone, iPod Touch and the iPad. One of the last-minute features announced was the Fine My iPhone features which allows users to track down a stolen or misplaced iPhone. 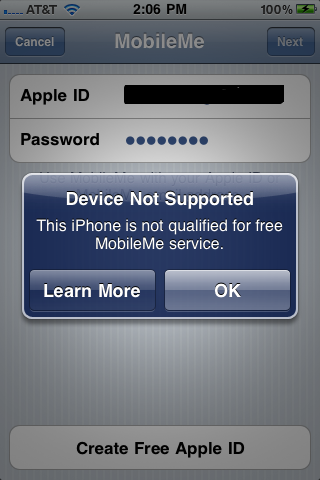 Until today you had to have a MobileMe account costing $99 per year. 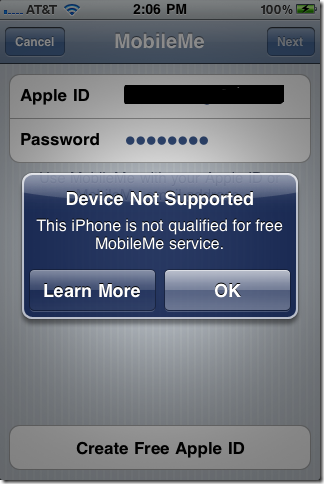 Today?s release gave iOS users a free MobileMe account which they can use for Find My iPhone. I downloaded and installed iOS 4.2.1 for both my iPad and iPhone 3GS through iTunes. Installation went without a hitch. Hmm?so maybe pre-iPhone 4 devices aren?t supported. I decided to give it a try on the iPad to see if maybe the service was just overwhelmed, following the same process the account was added and verified with ease. I then decided to give it shot on the iPhone 3GS one last time and viola..worked fine. So it appears Apple either has a bug in setting up an iOS device that is not current generation first or something got fixed. I have heard from another user who experienced the same behavior. Easiest fix if you experience the same problem, add your iPad or other device first. If no other device exists..well, then I?m not sure. 3. You can create a free Find My iPhone account on any iPhone 4, iPad, or iPod touch (4th generation) running iOS 4.2. Once you create an account on a qualifying device, use your Apple ID and password to enable Find My iPhone on your other devices running iOS 4.2. Find My iPhone is not available in all countries. I guess if you have only an older device, like the iPhone 3GS, you are out of luck. I would not have found this information by casually reading any information when setting up iOS 4.2.1 on my 3GS. Had I setup the 3GS second, I would not have run into this either.